Apparently the wi-fi is terrible everywhere around here. It wouldn’t even connect at Dunkin’ Donuts and Starbucks was so slow that I had to turn my phone into a hotspot (thanks Tayler!). I think I need a home office where I can blog all day. I’ll put it on my bucket list. A couple of you asked about a recipe for the dinner I made Sunday night. It is pretty easy to make and you just throw everything in a dish, bake it, and enjoy delicious Mexican goodness for days! I loosely adapted the recipe from Pinch of Yum. I prepped all my ingredients first so that the process went smoothly. 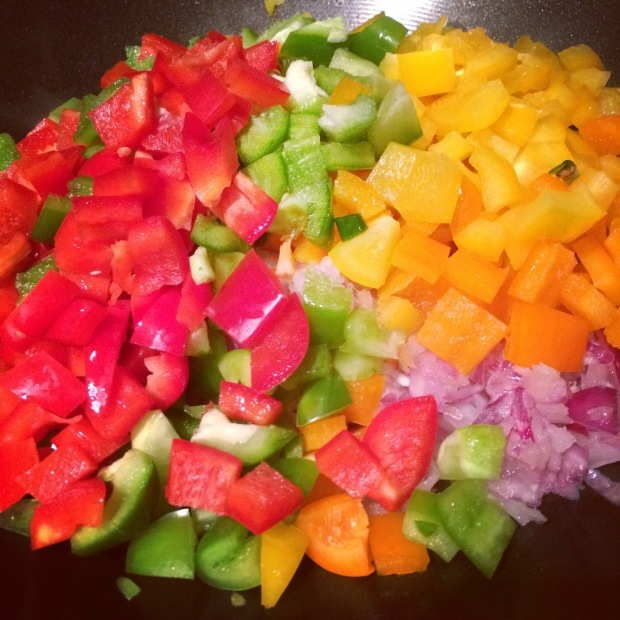 Chop the onion and peppers and set aside. Mix spices (minus taco seasoning) in a small bowl and set aside. I also had the rice pre cooked in the fridge, but if you don’t, either make that first since it takes awhile or use an instant brown rice you can make quickly. Preheat the oven to 400 degrees. Sautee the onions and peppers in 1 Tbsp olive oil until onions are translucent. Add the corn and spices and continue cooking for a couple more minutes until the corn is no longer frozen. Set cooked veggies aside. Cook the ground beef with the taco seasoning. Add more or less to your desired tastes. Do not overcook since it will also go in the oven with the casserole. Grease a 9×13 pan (I used a glass Pyrex dish) and layer the ingredients in the following order: small amount of enchilada sauce, rice, ground beef, more enchilada sauce, cheese (if using), sauteed veggies, the rest of the enchilada sauce, then another layer of cheese (if using). Once removed, let cool and top with diced tomatoes and guacamole (my suggestion). The guacamole really adds to it! 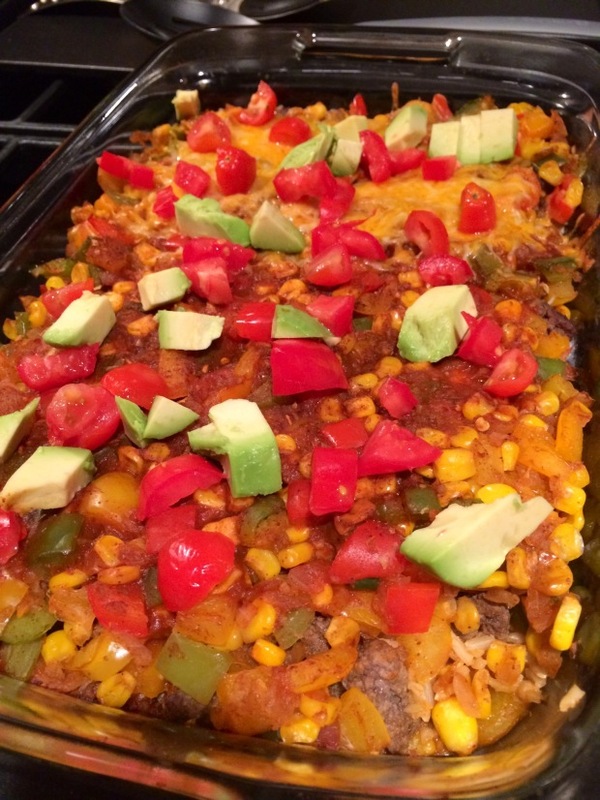 You can eat this casserole by itself, add tortilla chips for more of a crunch, use it as a burrito or taco filling, salad topper, whatever you so desire. I had a lot of this left over so I have my lunches set this week! Enjoy! Question of the day: Do you like Mexican food? Does anyone else have an issue with cilantro? Gross.